Jack Link's Biltong is crafted using only quality cuts of prime beef. After selection, the lean cuts are carefully seasoned and marinated with selected ingredients following a well-kept family recipe. 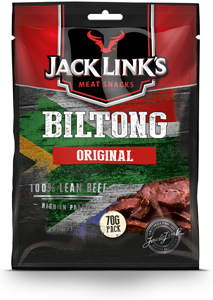 Finally, the beef strips are slowly air-dried and cut into thin slices, in the traditional South-African way. High in protein and low in sugar, Biltong provides that extra kick you need to fuel your day. A perfect guilt-free indulgence!